IF the story of Emma Ford’s life in falconry reads like something that would be convincing as the theme of a Disneyworld ride, then so be it. Here’s how the falconry fairytale happened: “My parents had divorced and I was living with my mother in a little cottage at Chilham Castle, and I would look out of my window every morning and this guy would be galloping past in armour, with a lance, on a black Andalusian stallion. That was Steve, my future husband, who was with the Jousting Association of Great Britain then, and they had arrived to be based at Chilham Castle. It wasn’t long before I met him at a medieval banquet. But Emma and Steve persisted, and now, 25 years later, they have a falconry school based at Gleneagles Hotel and another falconry school in Vermont, USA. “Yes, we are still working together and we are very lucky. We are never bored; we always have so much going on. The most important thing is every August, when we rent a grouse moor and we go away with our falcons and our pointers and have a working break. We are on the hill every afternoon flying our peregrines at grouse. It doesn’t get better than that. “That is what keeps falconry magical. I carry the cadge, which is the frame the hawks sit on, and Steve works the dogs. The pointers go on point and we unhood whichever peregrine we are going to fly. The falcon needs to have reached about 200ft in elevation for its stoop to be successful. So we let it gain height while the dogs hold the grouse on point. We work our way round, and when the moment is right we’ll flush the grouse. And the peregrine falcon stoops. That’s what it’s all about – that’s what you go out for, to see the stoop. We don’t actually get that many grouse. In the wild, peregrines only spend about two minutes a day hunting on average. A few times we have had a wild one come over higher than ours and we have had a double stoop. 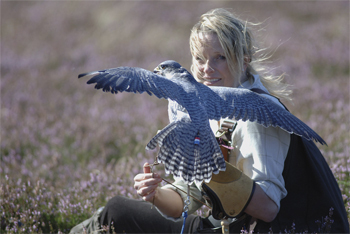 We fly our own falcons like wild birds, so to see a wild one joining in and performing is amazing. Cue the fairy-tale falconry ending.